The lovely Louise kindly agreed to let me loose with a guest post. She even sent a lippie for me to review which Royal Mail promptly stole and are now denying all knowledge of. Super. Nonetheless we will soldier on with this review of a brush which has become my new summer staple. Now I know when you think of summer staples you think of bronzers and sunscreen but for me and my oily skin summer means blotting papers and powder. Lots and lots of powder. I apply it every couple of hours for fear of BP setting up a rig on my nose. This little kabuki is a lifesaver. Because it retracts and has a lid it is very handbag friendly. The inside of my makeup bag no longer looks like somebody has been baking in it! The brush itself is incredibly dense which means that you do get a rather heavy application so it is best to use a light hand. 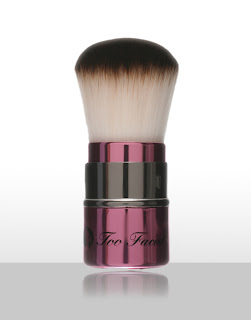 Too Faced famously use ‘teddy bear hair’, synthetic bristles, so it is animal friendly too. It is supremely soft and thus far hasn’t shed a single hair. I absolutely adore this brush, it's my favourite of all time! Looooove it!